During this year’s UNITI expo in Stuttgart Scheidt & Bachmann will show new cloud-based solutions that enable mobile site management. One highlight is sure to be the new POS that has received many new functions besides a new design. SIQMA POS can be started via a common web-browser with HTML5 which makes it completely hardware independent. The totally new GUI corresponds to the current flat design which users already know from many apps and web applications. User guidance is also similar to current functions seen in our Smartphones. You can swipe up and down or left and right to scroll through menus or delete items, active function keys are highlighted and intelligent menus open or reduce automatically depending on context. The return of goods also works much easier now. On every receipt there is a barcode which is scanned in case of a goods return. Automatically, the menu “Goods return” opens and the cashier saves the additional steps of navigating to the respective menu. Also, the search for receipts has become much more intuitive. A detailed filter function allows the very quick look-up of a specific receipt. 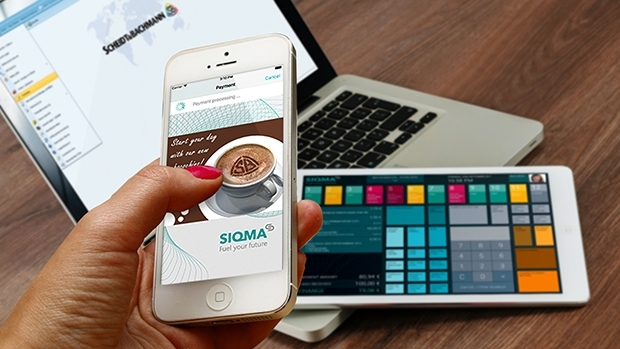 SIQMA POS is secured by a mobile device management system which monitors the systems in the background. For all site operators who want to offer a fast lane or around-the-clock service, Scheidt & Bachmann will highlight the new SIQMA CRID. SIQMA CRID is completely browser-based and with Linux as the operating system it can be controlled via the Cloud. All data is managed centrally and deployed to the connected systems via the Cloud. With SIQMA Fuel & Go it is possible to offer outdoor payment without any additional hardware investment on site. SIQMA Fuel & Go is a cloud-based solution that brings the outdoor payment terminal into the customer’s Smartphone. In general, SIQMA Fuel & Go can be integrated into every app, and via an interface, connectable to all POS systems. The Scheidt & Bachmann team is happy to outline additional details for realization, and also the opportunities that are available via SIQMA Fuel & Go during UNITI expo on stand 5B20 in hall 5.